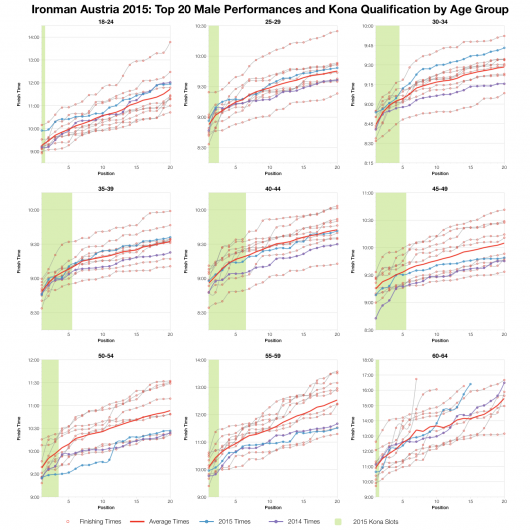 As I had the largest group of my athletes were racing at Ironman Austria this weekend that’s where I’m going to start my more detailed results analysis. 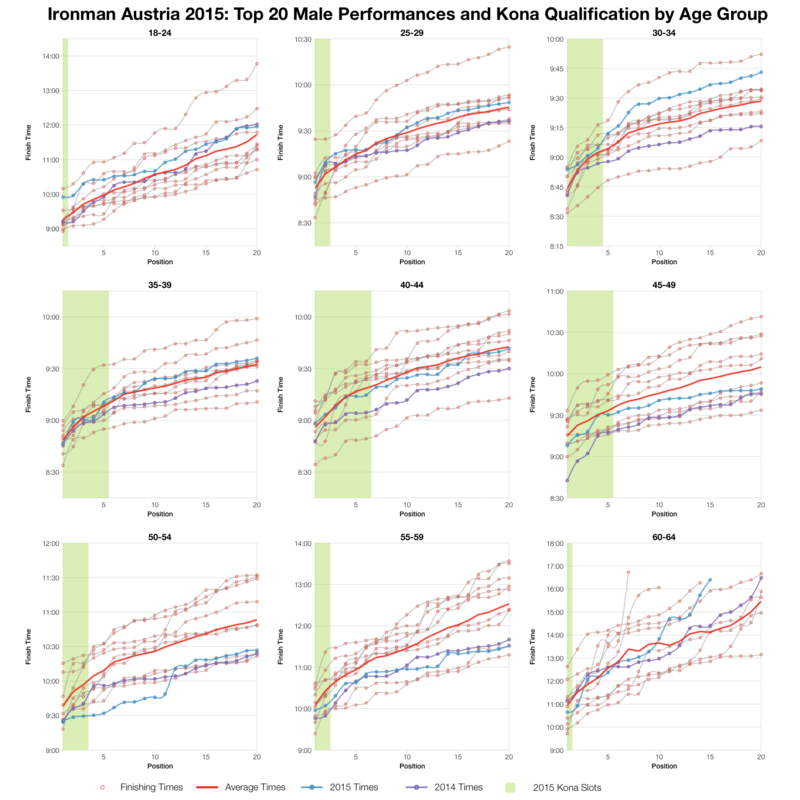 I had some good results in Austria with PBs and a Kona qualifier. 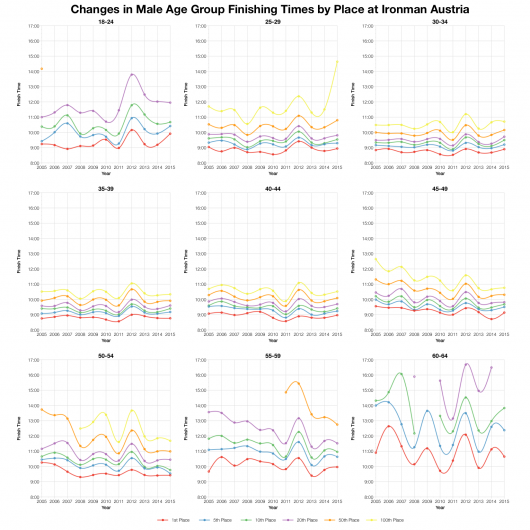 Beyond those I coach the race looks to have been typical of Ironman Austria – times don’t hugely differ from the last decade of racing. The only difference that might be detected in comparing the median splits comes on the bike. Times there tend to be slower than previous results, but not by a huge margin. Besides this small variation there are no clear trends across age groups. These are hardly significant changes, results largely conform to prior expectations. 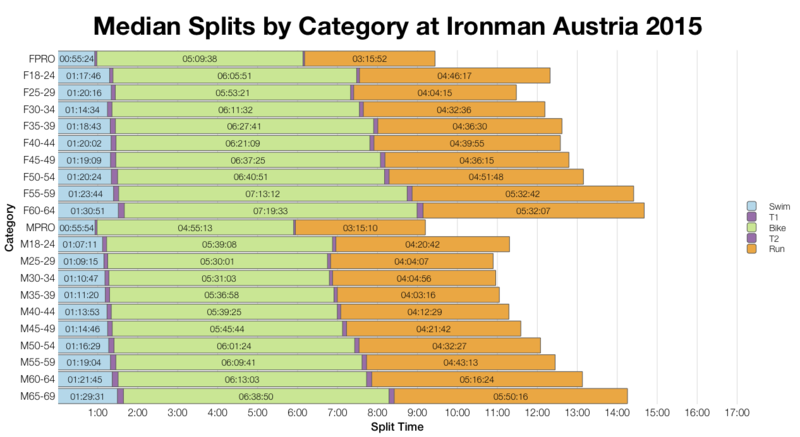 As mentioned in yesterday’s post the distribution of splits also suggested the race was on par. 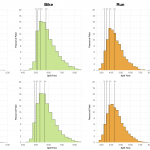 Again any differences in this year’s results show up on the bike where the distribution looks fractionally slower. As with the medians it’s small and an even smaller shift in run times might counter balance it in the overall finish splits. We are talking minute differences here. 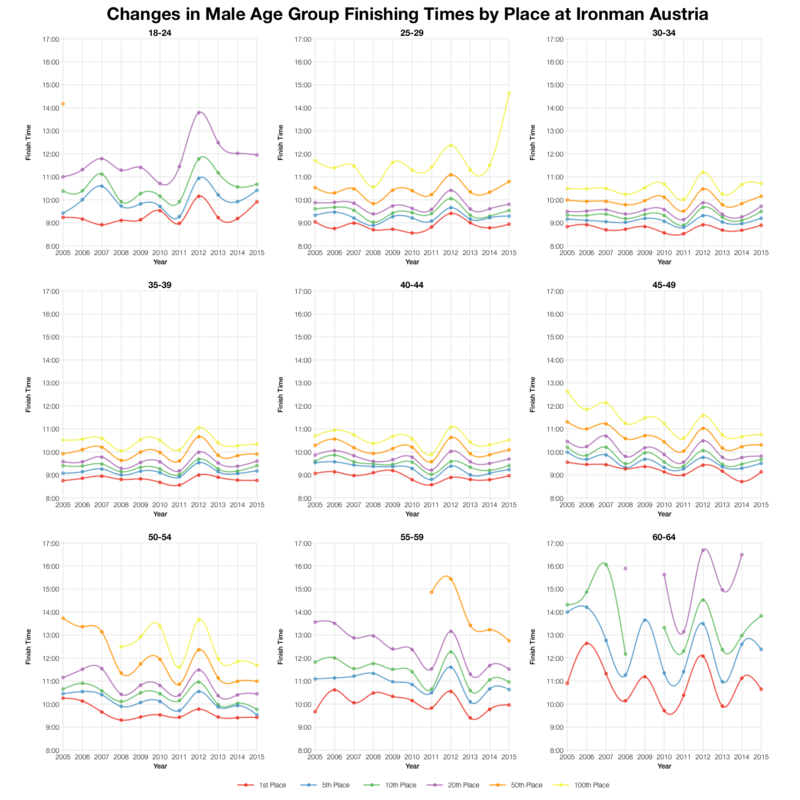 Again by looking at times for different finish positions in Austria we see how little this year’s results vary from the past. 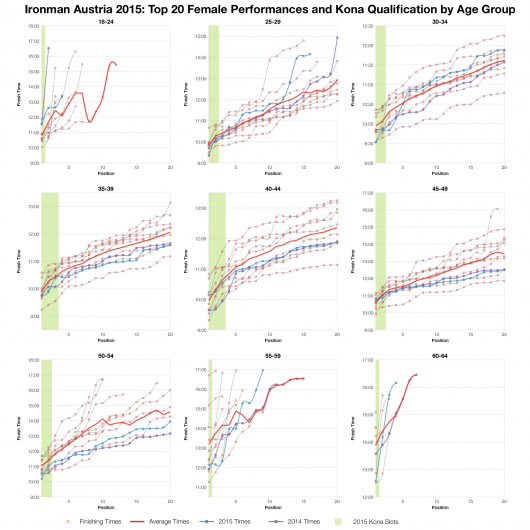 There have been faster and slower races; the times from 2015 sit comfortable in the middle. 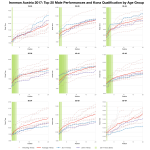 Sometimes a shifting middle pack disguises faster performances at the front of the age group race, but that isn’t the case here. 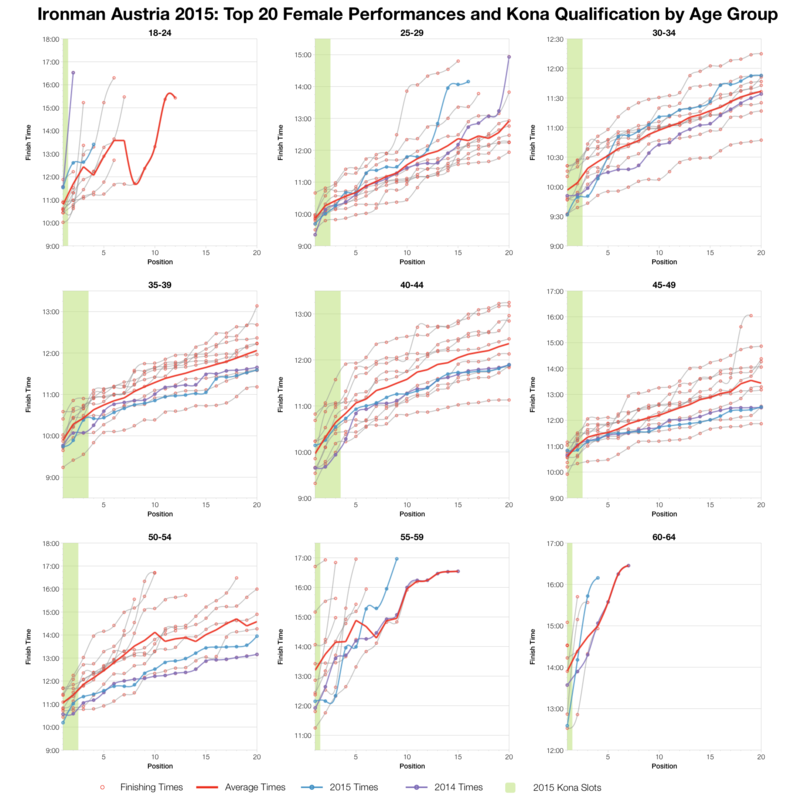 The top twenty times for 2015 lie close to the averages in the most part. That’s still not easy to qualify at by any means, Austria is always a fast and competitive race. 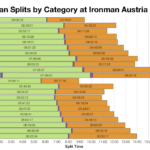 As usual you can access the full results and splits from Ironman Austria 2015 in spreadsheet form on my Google Drive.